Watching a movie, having a snack. Something presses on my leg in the dark! ZOMG, IT’S A GREEDY PIBBLE! Note the bat ears indicating that she might be interested in something. It’s pretty subtle, but you can probably make them out if you squint juuust right. And yes, she did get a tiny piece. There is nothing on this cover that I don’t like. 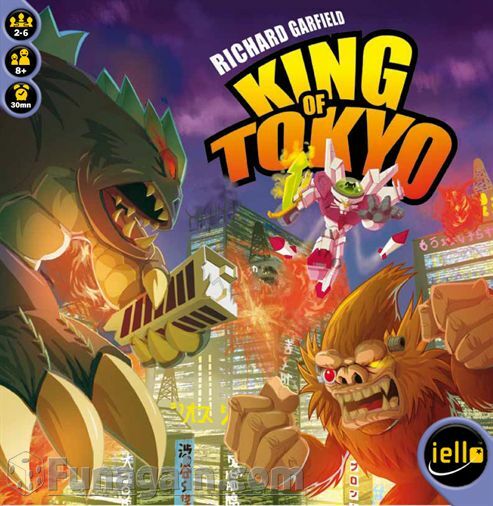 I actually had to search my own blog twice just to make sure I hadn’t already talked about King of Tokyo. I’m kind of stunned that I haven’t, but I guess it’s true what they say: when you get old, the first thing that goes is your memory of giant cybernetic rabbits tearing chunks out of downtown Tokyo. First, it’s awesome. There are very few games that I would unreservedly recommend for parties, kids, and serious gamers alike. This is one of them. The rules are few and clearly stated, the game is fast and furious, and it plays a ton of people at once. Also, you get to be a giant monster that mutates like crazy while battling robots/sea monsters/giant cyborg apes for supremacy. Second, the expansion just came out, King of Tokyo:Power Up!, which adds a mini-deck of cards unique to every monster that gives you badass new abilities. This adds a new dimension to the game without bogging the game down or making things complicated. If your friends and family get together over the holidays to play games, you should seriously consider adding this to your shelf. You can grab a copy on Amazon, here. 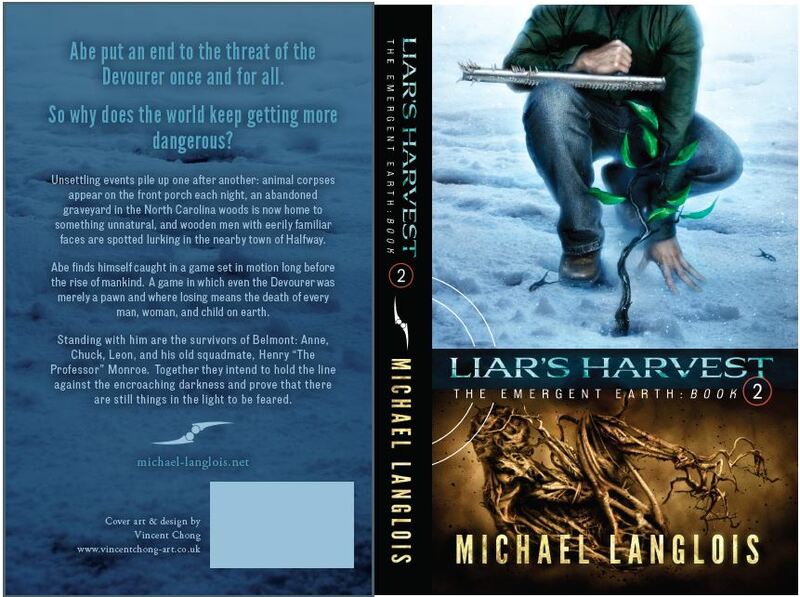 At long last, Liar’s Harvest is out the door and on sale! Huzzah! I had a lot of fun writing this one and I feel like I learned a lot along the way. Which is as it should be. But! I have a confession to make. These book launches scare me to death. I keep thinking that next time I’ll be a jaded veteran with my feet up, smoking a cigar and heaving world-weary sighs as my latest novel sails out into the world. Turns out, not so much. I’d like to thank Vincent Chong for yet another stellar cover. Fun fact, we actually did this cover twice. The first one was good, without a doubt, but I felt like it needed some kind of small tweak to make it stand out a little more. So I asked Vinny for advice, and his thoughts. He came back with a completely redesigned cover, which was a heck of a lot more work than a tweak, and brilliant. Thanks, Vinny. I’d also like to thank my editor, Neal Hock, and my copy editor, Cory Whiteland. It’s kind of humbling to send out what you consider to be a pretty clean copy and get back a thoughtful, concise list of your errors. Your many, many errors. If this book is readable at all, then you have these gentlemen to thank for it. I also want to express my sincere appreciation to Jennifer at 52novels.com for the fantastic formatting. She put up with multiple revisions, crazy chapter heading formatting requests, and all sorts of deadline shenanigans with the kind of patience and good humor that I will never, ever possess. Finally, I want to thank my wife, Susie, for her tireless support and enthusiasm for my work. None of this would have been possible without her. Likewise, all of you folks. Thanks for sticking with me. Win A Pre-Release Copy of Liar’s Harvest! You know what’s a long time from now? Tomorrow, that’s what. I sympathize with your lamentations, fellow calendar-haters. Like the hallowed chorus of, “Are we there yet?” from the back seat, you have been heard. 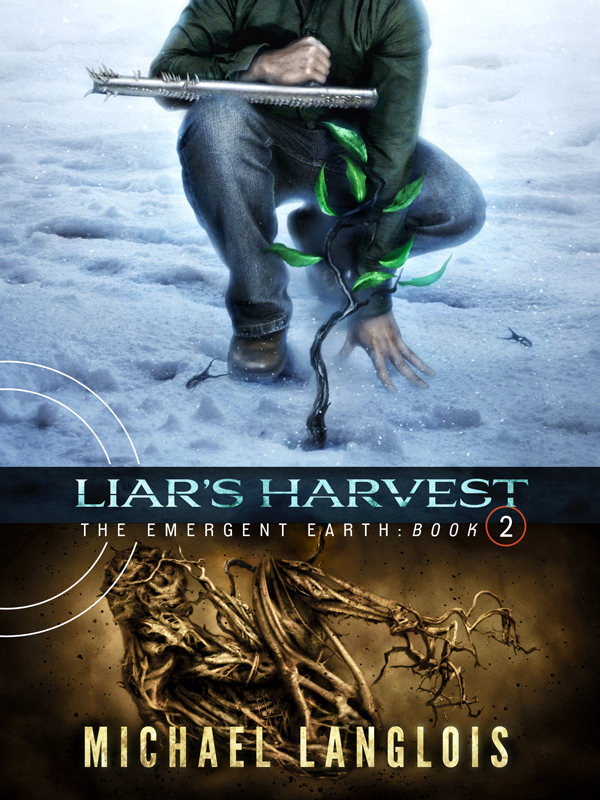 I’m giving away three pre-release copies of Liar’s Harvest today. 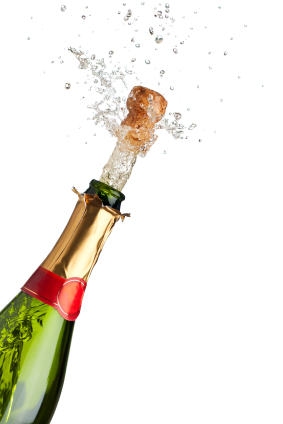 Winners will receive their choice of an epub or Kindle formatted ebook, given away at 8pm CST tonight. To win, all you have to do is drop a comment below. Winners will be chosen at random by the great and mighty RANDOM.ORG. HOWEVER! If your comment happens to be in haiku form, well then, your name will appear three times in the Grand List of Choosing. This will not only make your chances of winning go up, but it will also make your opponents seem tiny and ineffective by comparison! It’s a good strategy, I recommend it. Aaand it’s over, folks! Thanks for the lovely and hilarious poems: we laughed, we cried, we pointed fingers at the monitor. It was lovely. I do have one confession to make, however. No winners will be chosen by RANDOM.ORG tonight. In a decidedly un-random fashion, everyone in the comments is a winner! And not in the self-esteem preserving, elementary school science fair sense, either! Please email me at: langlois.mike (at) gmail.com and specify if you’d like your copy in epub or kindle format. And if you’d like me to send directly to your kindle, please give me your @kindle.com address *and don’t forget to authorize my email account under ‘Manage Your Kindle/Personal Document Settings’ on Amazon so that I can send you the ebook. * Note that this only allows me to send you books, it doesn’t give me any rights on your account or device. It’s just a spam prevention measure. Thanks again to everyone who commented, and I hope you enjoy Liar’s Harvest! So, a few of my fabulously stalkerish perceptive readers have pointed out that I tend to give away a lot of free books, especially around the time I release a new one. This is a true statement. They have also asked if that’s such a good idea for me from an income perspective. I think the better question is if it’s a good idea for me from a career perspective. Turns out, a new author’s greatest challenge has less to do with money and a great deal more to do with obscurity. I’ve been very fortunate with my sales since the release of Bad Radio back in October of 2011, but even so, the number of copies of my books out in the wild, both free and purchased, is less than 100K. I’m a microscopic drop in a bucket the size of Lake Superior. From a career standpoint, gaining a reader is more important than making a sale. Every time, no exceptions. 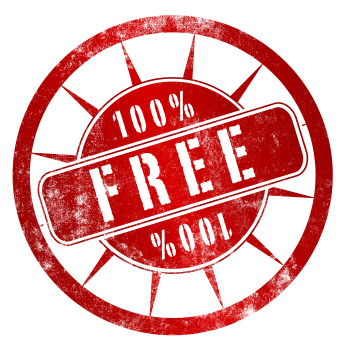 As has been mentioned elsewhere, most people are introduced to a new author for free. Either through libraries or being lent a copy by a friend. Today, it can also include ebook piracy, but for my purposes that’s just as good as any other method for getting in front of readers. Don’t get me wrong, I loves me some book sales. But people who like your work are happy to purchase books when they can, provided the price is reasonable and the quality is there. I spent most of my youth reading out of friend’s collections and libraries. The result was a love of books and an adult lifetime of purchasing them. Even as books trend towards electronic versions that might be hard to get from libraries or lend to friends, everyone should still have that opportunity. To that end, I will continue to offer all of my previous books for free during the launch week of each new book, as well as periodic surprise freebies every couple of months. It’s not charity on my part, just good business sense. And if it helps keep someone out there in free books, then all to the good. It’s finally time. Liar’s Harvest will be released at the end of this week on Friday the 16th! 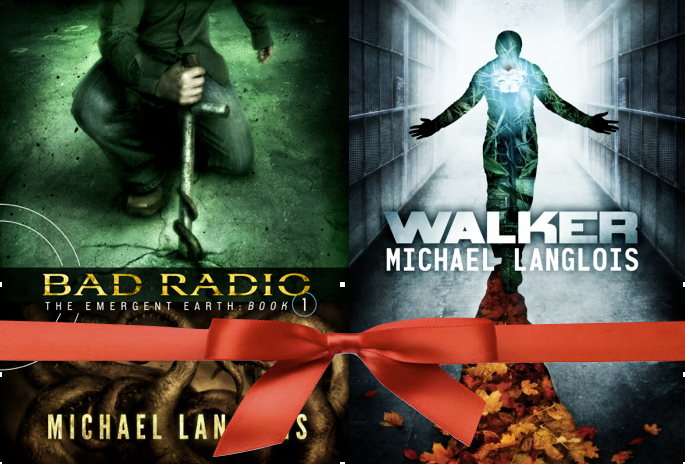 And to celebrate, Bad Radio and Walker are free until launch! It’s like a party, except without my dog running all over the house barking and popping the balloons. And without cake. I mean, for you. *I* had cake, and I think we can all agree that’s the most important thing. It was good, too. What was I talking about? RIGHT. If you haven’t read Bad Radio yet, here’s your chance to grab a copy for free. If you know someone who hasn’t read it, and for whatever reason your friendship has survived knowing this, point them in the right direction. Like I always say, it’s never too late for my friends to stop being wrong. Walker is also free this week because, hey, maybe you’re already caught up on Bad Radio and just need something to do until Friday. So, there you go. Enjoy and I’ll see you on launch day! Looking forward to launch day, coming up soon!